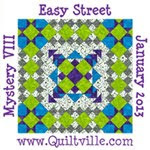 Bonnie Hunter has a new mystery quilt that begins today. Like I need to start another quilt. I haven't finished her Carolina Crossing yet and Orange Crush does not have a backing. Might as well finish out 2008 like I started! I have decided to go with her colors this time. I have to go forage in the sewing rooom to see what I have. I know I need some shirtings. I don't have a lot of these colors in there but that has never stopped me before. 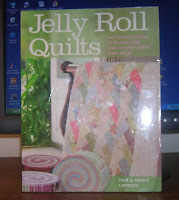 Gretchen has blogged that she will also be doing this one. I wonder if Becky will jump on the bandwagon! I have been working on several smaller projects (they are finished) but I can't disclose because they are gifts for friends that read this. I have piectures that I will post later on! I decided to work tomorrow and will be the RN in the house. That means I can't be playing with my sewing..but there is always the weekend. Henry has developed a new habit. Every time I sit down at the computer, he insists on sitting on my lap, with his chin resting on my arm. He is such a good boy, but it makes it a little hard to type! Happy New Year to all my blogging buddies....see you soon! 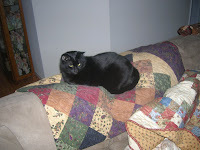 Spiff says, "That's one funny looking cat". Lilly has arrived in Alpharetta. 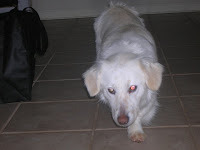 Laurie went to a rescue shelter yesterday and adopted Lilly. She is a mixed breed with some dachshund and other stuff. She seems very sweet...so far! And Laurie is happy to have a roommate once again. We want to live with you because your guys got presents and we didn't. And we were good boys this year..most of the time. A few faily shots of the Christmas festivites. I realized yesterday that there is not one shot of Tyler! I will have to go get one of him all by himself. Christmas night.....I am exhausted. We have been pretty much on the go since yesterday afternoon.....details to follow but I twisted a few arms to get this picture. It isn't easy getting us all at the same time. Sue, Kris and Sarah look pretty good. Laurie, Emma and me...not so much! 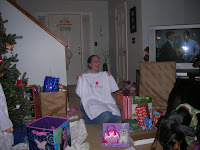 All in all, it was a good Christmas...lots of laughs and too much food! I needed to find my Christmas stocking. 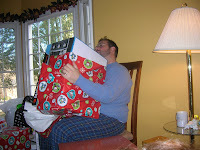 I think it is in one of the Christmas boxes of stuff in the garage. 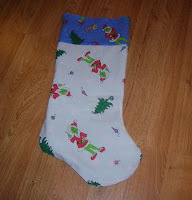 But since I have felt rather Grinchy this year, I decided to make myself a new stocking. 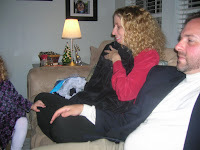 I have had the fabric for a couple of years and I found it this morning while talking to Laur at 6AM. She was up too! (That's what happens when you try to sleep in the same bed with Sarah!) Laur ended up on the couch. At any rate, I whipped up this stocking after wrapping presents this afternoon. I will embellish it after Christmas. It needs to be jazzed up a bit! On another note-I am off the hook on the lawsuit against a former employer. I was on the witness list but I found out today that the trial ended last Friday. Woot woot, I didn't have to testify. I feel like a Becky copycat! But I guess great (?) minds think alike. I had grabbed this pattern out of my "pattern pile" on Saturday after the cookie exchange. Cindi was needing a holiday charm square and I went into the charm square pile for her and picked this set out as well. 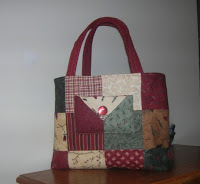 I decided that I would try to make this bag. Gretchen already has one too! So last evening I commuted between the kitchen and the sewing room being creative!! The coffee bread was finished by about 9PM. I had some this morning...yum-it is not quite right-it doesn't cut well but who cares...it tastes like Christmas! I was awake at 4:30 this morning. I seem to be having a serious sleep problem lately! So I got up and finished the bag. I will be needing a nap after work today. But I need to wrap presents. Don't have that many to do but I need to get all of the paper and stuff out. Can't believe that tomorrow is Christmas Eve. If nothing else, I am determined! I always make Swedish coffee bread on Christmas eve...but I have to work on Wednesday until about noon and then church is at 4Pm and then onto Kris an Tyler's house. No time for baking that day. I figured I would be too tired to start the process after work on Mon or Tues, so I had better do it today. I don't know what I did or didn't do but the bread went from the oven into the garbage-did not pass go or collect $200. It was nasty. I guess I will have to try again tomorrow after work after all. On a brighter note...Becky brought her Sassy 16 quilt yesterday. It is really beautiful. I knew I had to go home and find the pattern and make it too. 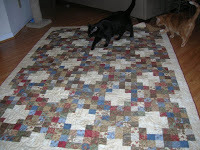 I had the In the Pink 2 line sitting on my sewing table, so I got busy cutting. I finished the quilt top this afternoon. I will have to find something to use as a backing. The pictures are the cookie exchange and the Most High Exalted Thimble showing the first project we will do in January. 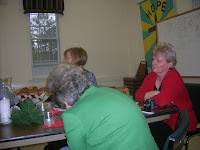 Today is the day of the cookie exchange for the Silver Thimble quilt club. I got the needed ingredients last night and this morning I du out the cookie gun. I put new batteries in the little thing and started to make the dough. Well the first couple of times I got the press to work...sort of. Then....nothing. So now I have these wonderful cookies (yum they really are tasty) that look like crap. I won't even say what the Efman girls call the tail end of the batch.....BUT they still taste good. The recipe is one from one of the ladies back at St. Mary's in Mohegan Lake. In my recipe file (funny huh!) they are called Peg Clark's chocolate Spritz. I don't know what there real name is. 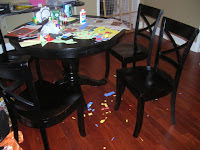 Now I am going to clean up the mess I made in the kitchen and be done with it!! Kathy and I go away back-our girls were little when we first met. Now we are both grandmothers-go figure! Anyway she is still a northerner and I miss her terribly. We have shared a lot. And she is a great cook too! I miss that too!! This evening when I got home, there on my porch was the box. I had asked her to send me a calendar with pictures of the Hudson River Valley. The calendar is published and supports a local charity. The photographer is a man named Joe Deutch. His photographs are take your breath away beautiful. Now I have the calendar with the pictures to look at. It is a weather calendar as well and tells when to expect snow or other forms of bad weather. AND in the box was extra treats. Bless her heart, she sent me Drake's coofee cakes and my-t-fine chocolate pudding too! Breakfast tomorrow...yum!! Thank you, best bud. Laurie is home from Japan. I have had high anxiety over the past couple of days. Don't know why but I did. Chalk it up to being a mother I guess. So I left work a little early today and drove over to her house. I beat her home from the airport. She looks well although tired from the long flight. Kris joined us for supper and then we all went home to go to bed. Well I'm not there yet, but soon! The reason for my crafting madness last Friday was to have the girls make homemade decorations for Laurie's Christmas tree. She is flying home as I write this. So last Saturday morning, I dug her Christmas tree out of the closet and put it up. Then Sue brought the girls over and they decorated the tree. 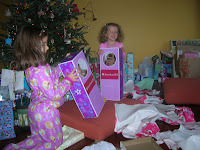 I also bought ornaments that I thought would appeal to the little girls-purple, pink, lime green. The construction paper chain and the glittery blue snowflakes really make for quite the tree! Not really Laurie's taste but set up with love by her niecelets! Two weekends until Christmas. I needed to start getting my act together. After I left Sue and the girls, I headed over to Northpointe Mall and the American Girl store. I should have known it is a botique! At any rate, into yuppie-dum I go-me with glitter and glue on my pants! 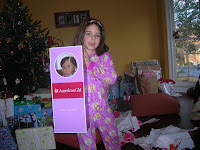 I had no idea what kind of doll to get for Sarah. So I picked a cute one out with blond hair and freckles. One present down! This morning I decided that I should continue so after church, I headed ITP. Mission accomplished two presents down. I sure wish I could afford to live in that area. It is really beautiful with the old homes and parks. Ah well-not in this lifetime! Stopped and took care of 2 gift certificates.....I am on a roll!!! Got stamps for the Christmas cards. Now I think I am done for the day. Don't you love those Publix commericals at Thanksgiving and Christmas? They are just so warm and fuzzy. No matter how many times I see them-and it is at least 2 or 3 times a day, they make you feel good. Go Publix!!! Messing up someone else's house..
Last evening I went over to watch the girls while mom and dad went out to play. I decided we should have some Christmas crafting fun. So on the way there, I stopped and got construction paper and glue and odds and ends and then stopped at Publix and got some stuff to make sugar cookies. The plan....trash the house! And I must say, the three of us did a pretty good job! 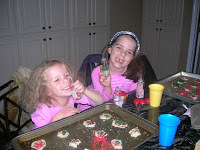 Sarah and Emma are quite good a decorating the cookies as you can see by the picture. We also made some brownie type cookies that were not quite as successful. I think Emma was a little disappointed that there were no chocolate chip cookies. Next time we will do that. Then on to the crafting. I found these great snowflakes and we just glittered them up like crazy. We also mad construction paper chains with lots of glitter. I bought Emma her own little scissors. Rob should be used to this by now as I think I gave Sarah scissors before this. 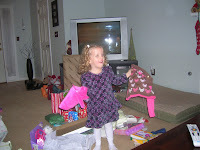 Emma was little Miss snip making all kinds of little pieces! All in all it was a fun evening except for the fact that Lainey (the dumb dog) got into the cookies and ate about half of them! I hope she got a really bad tummy ache! It is hard to believe that 2 weeks from today is Christmas. I have yet to start shopping-just can't get in the mood. Is the house decorated? that would be no. I dragged the reindeer out of the garage and put them in the front yard. There is a light out so one of them only has half a head lit. I unplugged them and that's that. Could it be seasonal affective disorder? Or am I just a lazy slug? I am glad it is thrs and only one more day to work this week. It has not been a great week-full of angst. The administrator left yesterday, the DON has resigned and the rumors are flying. At one point in the last few days, I considered going with him to his new facility but I have changed my mind. It is a problem facility and I really don't need to put myself in a situation like that...and I have such a great commute now-only 8 miles. I can be at work in 15 minutes on a good day. 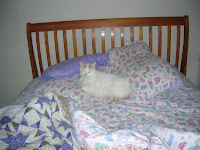 Have not touched the quilt I am working on since last Saturday. But the weekend is coming. Tomorrow though I am going down to take care of my little girls. I think we will make cookies or do something Christmasy. Laurie comes home in less than a week. I have to get a carvel cake for her birthday which is also next week. 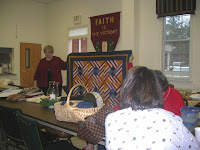 I am looking forward to the get together on the 20th with the quilting peeps and cookie exchange. I have to find my recipe for my favs...maybe Sue has it handier. Sarah and Emma have play dates so why shouldn't I? And yesterday I did! Becky coordinated a great day with friends from "Sisters". We met out at Sweet Home. But it was bonus time. Several more Sisters were having playdates also and Sister Superior was in the house! 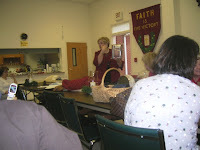 She has a "class Picture" on her blog Silver Thimble Talk. Becky, Ktistie, Gretchen and I worked on differemt projects. I brought 2 with me. Was I optomistic or what? At any rate, I did a lot of swearing because my project has directions that are terrible. I need to email the author and tell her her directions....well you know. Gretchen said it much nicer! It should have been simple. It is a pattern called Drama Queen and I chose this great fabric Melisa had in the front room. It will be quite pretty when I finish it, I think. 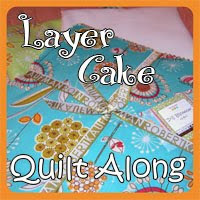 It was great being with the quilting peeps and I am so glad that Pat has found us a new location AND that Melisa will provide the kits. 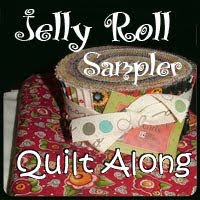 Quilters Rule! The mail came today...not so unusual-after all it is Wednesday. And there it was....the first Christmas card....and I knew before I turned it over to check the return address, who had sent it! This is ALWAYS the first card to arrive. By now my girls are chuckling because they know......"New friends are like silver, but old friends are like gold". The card comes from a couple who now live in Virginia. We were neighbors in Mahopac for only a few years, a long time ago. We never really had much in common except living on the same street. We only are in contact this one time of year. Truth is we will likely never meet again. But still we exchange the cards. She always writes the "Christmas letter" with the news of the year-he's retired from the FBI and she now has gone back to work, and he went hunting over Thanksgiving and bagged another deer. You know-really annoying. But still kind of funny because she always writes in the third person! I haven't even thought about cards yet. Drat I guess I will have to dig out the list. But back to her letter..she laways closes with thesilver/gold friend thing too! I am not ready for Christmas this year. I will have to crawl over all the junk I threw in the garage before the cleaning lady came to get to the Christmas decorations and right now it is too cold to fiddle with the wire reindeer. Calgon take me away!!! I guess I will go finish the book and think about decorations and cards tomorrow...or next week! Last evening I started reading Lover's Knot-a reccomended book from Becky's blog. I hate that I have to go to work today-I want to finish it. As I started reading it, I realized it takes place near where I lived half my life. A small town on the shores of the Hudson River, north of NYC. I think it is prbably patterned after Garrison, NY which is a cute little town between Peekskill and Beacon. It sits about opposite of West Point. Garrison was used for some of the outside shots for a movie Barbra Stresiand was in, I think Hello Dollyy but I am not sure. Again I am connected to the Hudson River valley. To those of you who only know me here in Ga, it is a beautiful, albeit cold place. Sometimes I miss it. Wide awake at 4AM-I knew this was going to happen! Last evening I finished the binding on the Dasiy Chain quilt from my very favorite book. Both Gretchen ans I love this book and are sewing are way through it! The fabric is from the Portobello line. 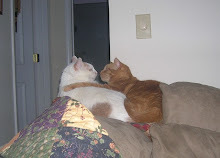 I am pleased to day that it passed the quality control-Henry and Spooky give it 4 paws up! Anyway back to the early hour-so after I finished the binding (only had about a half of one side to do), I got under it with another quilt and watched tv. The end-I was gone-fast asleep...but it was so cold last evening, I felt like packing my bags and moving to the equator. I hate being cold and it is January cold and not promising to get warmer anytime soon. The cold weather should make me feel like doing Christmas shopping but it doesn't. I have yet to get in the mood. The Christmas decorating Natzi (Sarah) wants to come over and help me decorate the house. Yikes-I have a hard time saying no to Sarah. Unfortunately she is not too interested in putting the stuff away after the holidays are over! 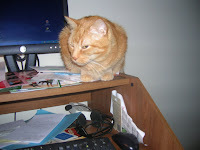 I have dumped so much stuff in the garage, I'll have to climb over to get to the Christmas stuff-that's another story! My girls decided I needed a cleaning person. She came yesterday. I spent part of Sunday cleaning! My guest room now looks like a guest room but don't open the closet because that's where all the stuff is! There and in the garage!